It a disease which causes a variety of signs, including hyperactivity, weight loss, excessive drinking and urination, increased (often ravenous) appetite, vomiting and diarrhoea. If untreated, the disease will eventually lead to serious heart disease, kidney disease, emaciation and death. 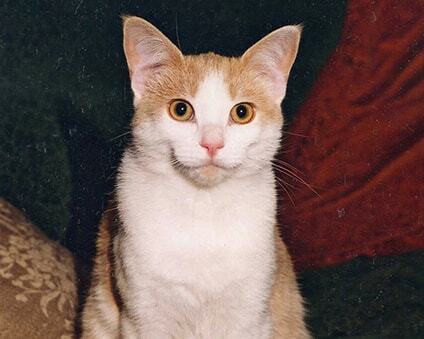 We have been using radioactive iodine to treat hyperthyroidism in cats since the late 1980’s. The treatment is not at all painful and does not cause any serious side effects. It is considered the most effective way of treating this disease as 90-95% of cats are permanently cured with a single treatment. The treatment is simple, but because it involves the use of a radioactive compound, there are strict laws in Australia relating to how it is given and the subsequent management. The radioactive iodine is given by mouth in a capsule by specially trained and licenced staff. We sedate your cat lightly to help them take the medication without stress and to minimise the chance of accidental spillage of the radioactive iodine. We check carefully that the dose has been swallowed properly, and then the cat is placed in a cage in our special isolation room, here at the Hospital. By law, cats must remain in isolation for at least one week following treatment, until radiation levels decline to a specific low value, as measured by a Geiger counter. Although it is a larger one-off cost, it is more cost effective than giving oral medication for life, and certainly less stressful for you and your cat. Riley was diagnosed with hyperthyroidism and before treatment with radioactive iodine he was only 3.6kg. He is eating well now and is now over 5kg!